This week in Your Parents Basement, we go soaring through Angel Land as Nintendo’s most-recognized cherub! The gang plays Kid Icarus, and has fun, despite dying way too many times even with the help of save states and strategy guides. To listen to this week’s show, click here! And as always, you can listen to this week’s show by downloading from the iTunes store – be sure to give us some starrrrssss! (In fact, you don’t even have to listen to give us stars, you know.) To manually subscribe to the pod, input this link to your device of choice. You can also follow us on Twitter, or ‘like’ us on Facebook. 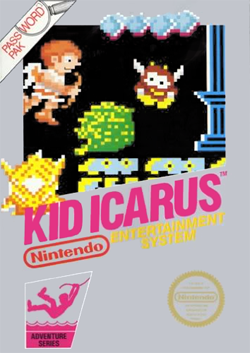 On this week’s show, we were joined by Paul Christian Glenn, who someday hopes that his progeny can fulfill his dream of defeating Kid Icarus. Paul is the co-host of AfterPod, which is a daily podcast show about The Adam Carolla Show, The Mystery Show, and when it comes out, Serial’s second season. If you like the clever shut-ins of Your Parents Basement, you should give AfterPod a listen-and-subscribe as well. – The list of characters and enemies that we mention on the show. The green-haired lass is Palutena (Pail of Tuna). For a helpful chart of the enemies with their appearance, check out the invaluable Kid Icarus page on Strategy Wiki. – Since we didn’t mention it on the show when we usually do… Because it was a cult classic, an NES copy of the game is somewhat rare now. On eBay, the game alone goes for between $10 and $20, with the manual alone costing around $20. A complete game, manual and box combination goes for $50 to $100, depending on what condition you want it in. – Want to play Mother 3? You can find details of the fan translation here. It’s a solid, but maudlin, Game Boy Advance RPG. It’s not quite as good as the Super Nintendo Earthbound, but it’s still definitely worth playing if you liked that game. – Other games briefly discussed on today’s show, in the Video Game News Rewind segment: Diablo 2, Marvel vs. Capcom 2, Jet Set Radio, Ultima VI and Wing Commander.